Work for MiniTool Power Data Recovery? Learning about MiniTool Power Data Recovery? ""MiniTool Power data recovery" the application that will allow you to find your personal files quick"
Thanks to the application "MiniTool Power data recovery" you can recover lost information on your hard drives, whether photos, documents, videos or any other type of file, the application recovers your files, you can specify a particular hard drive of your personal computer , or some specific partition to start looking for and finding those deleted files, whether they have been deleted accidentally or by some error in your hard drives, the application recovers it, it is remarkable the ability to recover entire partitions, which for some reason have been eliminated or present some type of error, and can not access the information contained on the disk. On the other hand it is important to mention that the application has a very small size, so it will not occupy much space on your hard drive. it would have been convenient for the program to have the possibility of creating a startup disk to start the operating system when the computer suffers an unexpected malfunction. users generally do recommend the program because it is very easy to recover lost information or deleted from the hard drives of the computer, plus full hard drives recovered, and partciciones in Raw format is quickly passed to the format of conventional traditionally files, and the most remarkable thing is that the application almost does not consume system resources. since the installation and implementation of Minitool whenever problems occur with the files deleted on the hard disk they have been able to recover quickly and without major problems, sometimes a hard disk was converted to the RAW format and with the application you can go back to the file format normal and thus access the information contained on the disk. "MiniTool Power Data Recovery al rescate!" MiniTool Power Data Recovery te va ayudar a recuperar tus datos más importantes de tu disco duro, partición o opendrive, en caso de desastre, ya sea de origen humano, natural, ataque malintencionado, error del equipo informático o una falla grave del disco duro. Podrás rescatar desde cualquier tipo de archivo hasta los historiales de tus navegadores,. Cuenta con una interfaz muy intuitiva, desde la que elegiremos el disco, Pendrive o partición a la que queremos pasarle la aplicación. Una vez obtenido los archivos, se podrán copiar a otra unidad diferentes de destino. MiniTool Power Data Recovery también podrá arreglar, si está dentro de sus posibilidades, el arranque a disco con problemas. MiniTool Power Data Recovery hace milagros, e incluso se atreve a intentar recuperar datos de CDs o DVDs con rayajos. La interfaz es muy limpia e intuitiva, aunque hay que tener unos conocimientos básicos a la hora de manejarlo, como saber lo que es un disco, volumen o partición. No cometas el error de instalar MiniTool Power Data Recovery en la unidad de la que deseas recuperar tus datos, ya que al instalarse podría ocupar los sectores del disco duro donde podrían estar los datos que fueron borrados accidentalmente. Tanto la versión del programa personal como la de negocio en mi opinión es excesivamente cara. Hay alternativas en software libre gratuitas igual de poderosas, aunque no tan intuitivas ni rápidas como la ofrecida por MiniTool Power Data Recovery. De todas formas se ofrece una versión gratuita que te permite recuperar sin pagar licencia archivos de menos de un giga de tamaño, mucho más explendido que otras alternativas comerciales más limitas en su versión de prueba. No hay versión para Linux. Otra desventaja algo molesta, es que mientras esta en uso no se puede minimizar la pantalla de recuperación, y tarda bastante tiempo en terminar. No permite escaneo parciales. Debe aplicarse al volumen completo. Otra cosa que no me gustó nada es que no incluye el lenguaje español. Es una herramienta muy útil para tratar de recuperar archivos por borrado accidental. Lo suyo sería tenerlo instalado en disco antes de que ocurra el desastre o podrías perder datos si lo haces a posteriori. La versión gratuita esta limitada a recuperar archivos siempre que no te pases de un giga. La versión de pago es algo cara. Pero el programa es muy potente y eficaz. Quizás merezca la pena la inversión. Y casi siempre hemos conseguido rescatar casi el 100% de los datos y archivos que se necesitaba de manera más urgente. Es muy fácil de utilizar, y gente con pocos conocimientos informáticos la utiliza sin problema alguno. "Recover lost files quickly and safely"
what I like the most is that the program is very simple, and the interface, although simple, is very effective, since it has access to the program's tools, such as recovering multimedia files, recovering information on CD / DVD disc, recovering partitions and deleted files to the recycle bin, the recovery of partitions is powerful, even if the partitions is in RAW format I was able to recover all the files and images that were on the hard drive. It is important to emphasize that the use of the application does not require more knowledge since the program is made for the average user so that he can recover files that have been deleted or lost. of the program I do not have many negative things to say, however I would like the program to be faster in processing the hard drives, especially when they have a lot of data, which makes the recovery of the files take a long time. I recommend powerdata recovery since it allows you to recover quickly and easily the files you have lost, for the graphic designer it is a fundamental tool since at work we handle and store many files so you are always at risk of getting lost due to unknown causes, The application is fast, easy to use and its interface is very intuitive. in my work I handle many image files of different formats and the same I have it on an external hard drive, unfortunately it has happened to me on several occasions that the partition is damaged, or has some loss of data, which caused my colleagues to recommend me This application and to date has served me consistently in the recovery of my files. Super easy to use interface; a thorough, DEEP penetrating scan and recovery tool. There is NOTHING to dislike about this product. The nature of data recovery is complex, and MiniTool Power Data Recovery does a great job to simplify that process. It is POWERFUL and just WORKS. PERIOD. I recovered files that I could no longer see or access. They were GONE from view and inaccessible to me. I am a photographer. I covered a memorial ride for a young wife and kids who lost their father in a tragic motorcycle accident. I had hundreds of heartfelt photos with family and friends who came together to honor their fallen friend. Somehow, during a cut and paste process to move files into a newly created folder, the files got lost. I accidentally used the undo command a few times, which deleted the new folder, undid the clipboard copy of photos, and the physical copy of the photos were GONE. I'm an IT guy, over 20 years experience. I did a TON of things to try to locate/recover the files. They were GONE. PERIOD. I searched for and found this product, tested it, was blown away by it and eagerly gave them my money. Files were restored and the photos were delivered to the family. "the most complete software for the recovery of lost data"
The software has many positive aspects, among which we can mention, it does not consume the operating system's recursor, which makes it an application that may be working and while you are doing another task, it allows to recover images, videos and files in general that have been deleted accidentally or that have disappeared for unknown reasons, it is important to note that it also allows recoveries on CDs and DVDs that are scratched and unreadable by the operating system, and not least is the function of recovering lost partitions by making Minitool power data recovery the most complete application for the recovery of all types of files. the application is excellent however the graphical interface can be improved, and the functions of the main screen of the program can be added additional ones. On the other hand it is convenient to have support for multi languages and in this way reach a wider range of clients. It is important that this application is installed on all PCs, since in a few steps people in general can recover photos, videos, documents and files in general and the most important in a simple way with the help of the program recovery assistant, is It is noteworthy that the program is not expensive and above all, efficiently performs the tasks for which it is designed. The option of recovering information from CDs and DVDs is important to take into account since many times we have valuable files backed by CDs and DVDs, but unfortunately they are deteriorating, so having this application is very useful to recover it. and re-record them. The application particularly has been very helpful, especially in the recovery of personal photos, because by accident my daughter deleted the entire folder of images of the pc, and thanks to the application it was possible to recover all the photos that had been accidentally deleted, on the other hand I have to mention that with the application I was able to recover files from old disk that I had saved and now their information has been backed up on other discs. "Un programa que tener siempre a mona por si surge un problema." Uno de los principales atractivos de esta aplicación es su facilidad de uso, por lo que resulta sencillo usarlo para cualquier usuario, aunque no tenga excesivos conocimientos en el tema. Dispone de una versión gratuita que nos permite recuperar 1GB de archivos sin necesidad de tener que pagar por su uso. Requiere instalación en cada uno de los equipos en los que se va a usar. No puede ejecutarse de forma remota o en la nube. Al ser un producto diseñado para usarse en situaciones de emergencia, como perdida de archivos y demás, la versión de pago resulta algo cara si no vas a darle uso a la aplicación con frecuencia. Recuperardocumentos y bases de datos borados accidentalmente y recuperar archivos y sectores del disco coruptos. When it comes to data recovery minitool power data recovery is one of the most popular and best out there. there are a lot of options to recover at different occasions like disaster data recovery or when the whole partition gets deleted. when it comes to pricing there is a free tier which allows recovery up to 1 GB and you should get the subscription if you wish to recover more. the program interface is clean and there you can see the options to recover data. you get to choose the hard disk from which you need to recover the data and you're set the program automatically scans the drive to find deleted files. you can select different recovery options to make the program scan for files on different levels. there are also options to recover deleted filrs from external media or from DVD. after scanning the deleted files are arranged on the basis of extension and into groups such as images, documents and video. the program can also recover system files which can come in handy if you accidentally deleted a system file. the recovery process is fast but scanning is too much time-consuming. the scanning/recovery process also slows down the system. you cant recover files from select folders but only from hard disk partitions. Miniitool power recovery is one of the best recovery solutions, they have a free tier so try them. the program slows down the pc when recovering data. I have trouble recovering data from the windows server operating system. this is one of the most popular product for data recovery and is highly recommended for anyone in need. recover deleted files from hard disk and other storage devices. "Recuperación de mi información que por un momento creí perdida"
Me gusta que gracias a este software pude recuperar información muy valiosa para mi equipo de trabajo, por error elimine una partición de disco, estaba muy ansiosa hasta que un amigo me recomendó este programa lo aplique y salve la información. No me gusta que no haya una versión para linux, considero que un software tan completo como este debería tener soporte en todos los sistemas operativos y linux con el tiempo ha crecido en usuarios. Lo recomendaría por la cantidad de opciones que tiene este software para recuperar información, podemos recuperar archivos de una partición de disco perdida, de nuestros medios digitales, sean cámaras o dispositivos MP3 o MP4, el programa es fácil de usar, puedo recuperar gran cantidad de megas de información. Con este software podemos resolver problemas con rapidez en cuanto a recuperación de información muy valiosa para las empresas o particulares, por lo que en el ámbito comercial resulta efectivo al dar respuestas satisfactorias a nuestros clientes. 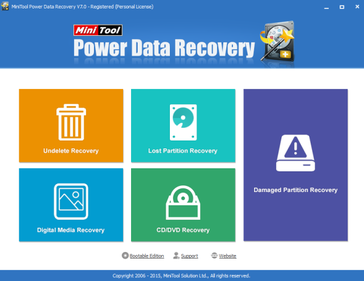 "program for the recovery of deleted files on hard drives and removable media "
although minitool power data recovery is a program with high reliability and efficiency there are opportunities where the program takes too long looking for information, and finally after a long time results in not working properly, in the option to recover files of dead discs, it is there where sometimes it is impossible to recover information, because if the disc can not be accessed by the system the program will not be able to make any recovery and it is unfortunate that they publish that the recovery is complacently effective. I highly recommend the program since it performs an exhaustive search of data, achieving a recovery of almost 100%, it has a high effectiveness in the search and recovery of deleted files, or of those files that are deleted or disappear for unknown reasons, it has a high effectiveness in recovery of partitions in RAW format, also presents a high effectiveness in the recovery of envirulados files, so that those who use it can feel satisfied because the program performs an effective task in the recovery of data. At work always occur situation of data loss, the use that is given to computers is constant, causing them to suffer from loss of data of unknown origin, and that is not to mention that sometimes I accidentally delete information sent to me by mail and download to view later that unintentionally deleted, so that the program has come to solve this loss of data occurred by oversight, however I must mention that in an opportunity but a loss of data I had a loss of a partition , which was converted to RAW format, a situation that I despaired enough because it had important data of my daily work, however thanks to the use of the program the partition recovered without problems being able to access the contents and data on the disk.
" MiniTool Power Data Recovery = Your solution to the loss of information." This application is very easy to download and install; and it offers a graphical interface with very simple options that facilitate the recovery of files deleted or lost from a storage device. Actually this software is very useful and in case of having an accident with your information it provides you with a series of advanced options that allow you to recover it quickly. The trial version only offers you 1GB of information retrieval, and we are clear that we currently handle large volumes of information, especially when we talk about photos and videos whose storage space is greater every day; It would be necessary to take into consideration to increase this allowed capacity and in this way provide the users with more opportunities to test this application. Of course, we must also take into account that these are decisions of the owner of the application and that this capacity can be increased by canceling an additional amount. On the other hand as I understand the version is not available for Linux which represents a disadvantage today. This is a quite powerful software and you can be sure that you recover all the information of your devices. It is very easy to download, install and use. On several occasions I have used different software to recover very important information from my USB flash drive; and among all I can assure you that this application has worked at 100% even when I have given up. "La herramienta de recuperación de datos más simple y efectiva"
La interfaz del software es intuitiva y sencilla. Detecta todas las unidades de almacenamiento que hay disponibles en el sistema, incluyendo aquellas que Windows no muestra en "Equipo", lo cual es genial para recuperar datos perdidos. En mi caso, usé este software para recuperar un vídeo y un archivo de configuración importante de un software de edición de vídeos que utilizo y los recuperó rápidamente cuando creía que no tenía solución. Ofrece notificaciones para informar al usuario de cada proceso que realiza, lo cual es muy útil. Así mismo, ofrece la opción de generar copias de seguridad de los discos para evitar pérdida de datos. La versión gratuita del programa solo recupera 1GB de datos. Las versiones de pago son demasiado caras, teniendo en cuenta las funciones que realiza el programa. El software no está traducido al español. Si estás buscando recuperar poca cantidad de datos, este es el software adecuado para ti. De lo contrario, hay alternativas mejores. El software me ha permitido recuperar archivos importantes para mi trabajo en mi empresa. Si no hubiera podido recuperarlos, habría provocado un retraso en la publicación del contenido e impactaría en mi puesto de trabajo y en la empresa. Además, hemos establecido con el software una copia de seguridad semanal, lo cual garantiza que nuestro trabajo no se pierda. Minitool power data recovery is one of the most popular solutions when it comes to recovering lost data. the most basic version of the software is free if you don't want to recover data over 1GB. I started using this product years ago when few of my documents got accidentally deleted and this program recovered it without any hassle. if you need to recover over 1GB you have to pay just about $70 which is absolutely worth what you're paying for. the program is very slow when it comes to scanning and recovering lost data. there are cheaper alternatives when the premium version of this software is considered for recovering large chunks of data with similar features. the software hangs the system while recovering unless you got a high-end system. also, the scanning stops if there are bad sectors in the hard disk which is annoying. the recovered fils gets damaged if the size is too high usually over 1-2 GB. the software is one of the best if you want to recover data under 1 GB and basically its free. if you need to recover a large amount of data this is still one of the best but there are cheaper alternatives. try and choose for yourself. Minitool power data recovery is a solution for recovering lost data from windows systems. the software scans the storage deeply and recovers them efficiently recovering over 90% of the data without damage. otherwise, it's a great software and basically its free so a good catch. "Fast but poor customer service"
The basic version of the software is free that could recover up to 1 GB of data. Minitool power data recovery gives everyone a chance to try and find what the software can do. I had the main issue a few years ago while I accidentally formatted an external drive that contained a lot of data. My friend recommended the software, and I was able to recover the whole files in a tiny time frame. The software is very light and takes less than 100 MB of hard disk storage and doesn't affect the system performance. the recovery process is very simple with a very basic user interface. the software supports all major windows operating systems and recovers all known file formats including system files. the quality of the recovered files are great and most of the files are usually unaffected by the recovery process. the software can recover data from all sources including but not limited to external hard disks and thumb drives. the system slows down a lot while performing recovery actions. the speed of recovery is not really great when compared to other software in the market. the software usually try to scan bad sectors and slows down recovery options. the personal version doesn't support windows server operating systems. the basic version of the software is free in case you want to try the software. this is a program that's used to recover files that got accidentally deleted. "Excellent value software at a fraction of 3rd party Data Recovery"
Ease of use. Having started with the free version as a trial I have installed this on customers computers who have purchased full licences. Intuitive, user friendly and does what it says on the tin. Nothing at all. As the saying usually goes, you get what you pay for; but this software is an exception. Lots of bang for your buck. Try the free version to see what it can do, I can guarantee you'll upgrade. Photograph and personal data recovery following accidental deletion or hard disk faults. Es una plataforma robusta de recuperación de datos que puede recuperar información de numerosas ubicaciones, incluidas unidades dañadas, medios digitales, CD, DVD, partición corrupta o perdida. Todo el proceso es simple y efectivo y no requiere mucho esfuerzo. it supports data recovery in many areas like recover mistakenly deleted files and recover virus attack files and etc. This tool is support more formats of data recovery like files, OS, Virus files and etc., and it is very easy to use and rocover the data. "Simple to use and reliable data recovery software"
3. I recovered a media file of more than 800mb successfully so no complaints from me. 4. More affordable than most other data recovery software solutions. Nothing to dislike i found in the software except the speed of scanning and recovering but I don't mind it because it gives accurate results and successful restoration of the data. Simple and easy to use data recovery software that does the job of recovering deleted files. restoration of accidentally deleted data. "Recover your Data in case of disaster"
For ease of use and effective data recovery, Power Data Recovery will handle most jobs just fine. You can recover data from flash memory cards and optical media. It doesn’t allow you to skip sectors that might halt a scan. Scan operations can take a long time, and working around the Power Data Recovery window and dialog is annoying. Recovering a lot of lost data. "best data recovery tool to use"
best software that i have ever met with ,for data recovery is this tool. no huss fuss , most of the work is done by itself. you have to just sit and relax . No worries if something wrong happens , this software will take care of each and every data you have on you system. although software is good in all aspects but it also have some loose ends. first of all it is sometimes slow, and take lot of time. second its user interface is not that good. protecting important data in case of miss happening . MiniTool has some fantastic software and this one I have used to recover important data from hard drives. Highly recommended along with all the MiniTool softwares. Nothing to dislike, no glaring improvements needed. Saved down time by recovering important databases, valuable time saved from reentry. "i found this very useful "
some times it was a little slow there were a few times where I was not able to use this product to retrieve data. "Help your data from vapourising ,use MINI TOOL." Software have very good interface which is good for user. It recovers almost all the data and very important for industries, as data is all its treasure. Although the power tool data recovery is good but a little bit slow in processing. "Data recovery software is always an important tool to have "
There is a free version that can recover 1gb and the price point of the full version is really well priced. There are less features on Mac than windows version. "Perfect at scanning the damaged sector "
* We monitor all MiniTool Power Data Recovery reviews to prevent fraudulent reviews and keep review quality high. We do not post reviews by company employees or direct competitors. Validated reviews require the user to submit a screenshot of the product containing their user ID, in order to verify a user is an actual user of the product. Hi there! Are you looking to implement a solution like MiniTool Power Data Recovery?